A Houston lesbian couple celebrating Mardi Gras were found dead near a Dumpster behind Fisherman’s Cove Food Mart in Galveston, Texas, on Friday morning, according to ABC News. 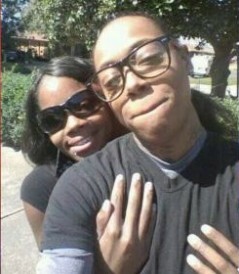 Crystal Jackson and Britney Cosby, both 24, lived together in Houston and had been together for two years. Jackson has a five-year-old daughter. It appears the women were killed elsewhere and moved, detectives told ABC News. The women died in different ways. Police say motive is unclear at this point. The couples’ newly purchased silver 2006 Kia Sorrento is missing. Investigators say whoever took their lives may have the vehicle. Call the Galveston County Sheriff’s Office tip line at 866-248-8477, if you have information about the murders or stolen car. Posted March 10th, 2014 & filed under News. This is so sad and my heart goes out for the family. The family is trying to raise funds for the funeral. Please help out if you are able too. And, what is the license number of the missing vehicle? I think it would be easier to watch for if we had a better description ie. license plate. I hope any follow up information is also shared via this route. Information provided by authorities indicates that the tags were temporary paper tags as the vehicle was new. No number has been published.